The Tools / Settings menu command lets you specify several important program settings and defaults. Forces the Read-Only mode for consecutive File / Open commands. This mode is useful if you want to ensure that no file will be inadvertently changed. Creates a new, empty file if the program starts without arguments. If this box is checked, opening a file from a command line or a Windows menu creates a new FlexHEX instance. If this box is cleared, the file will be opened by the existing FlexHEX instance. Please note that this setting does not affect opening a file using the File / Open menu command – that command always adds a new file tab. If this box is checked, the original file will be saved under the name filename.BAK on the first save. It is highly recommended to keep this option turned on unless you are editing a really huge file that is not practical to back up. Play short beep sound if an error occurs. Specifies which insertion mode is set on the program start. When you enter or insert data beyond end of file, FlexHEX automatically inserts a block of zeros from the end of the file to the current insertion position. If the size of the zero block is equal or greater than this value, FlexHEX inserts sparse zeros, otherwise real data will be inserted. Even if FlexHEX supports files up to eight exabytes long, your file system is unlikely to allow files that large. This option makes sure you will not exceed the file system limit while editing. 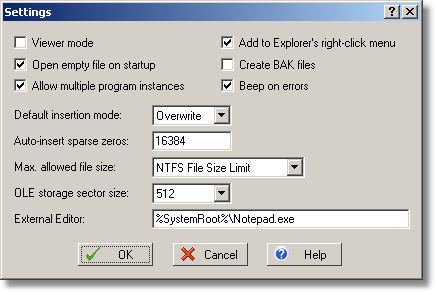 By default FlexHEX limits the file size to 16 terabytes, that is the NTFS maximum file size. OLE compound file implementation can be configured to use 512 or 4096 byte sectors. 4096 byte sector files have less limitations, however you may have problems accessing such files with older applications. The MSDN article "Compound File Implementation Limits" discusses the matter in greater details. The path to the external text editor that is to be used for editing FlexHEX-related text files (for instance, structure definition files). As the screenshot shows, the path may include system environment variables enclosed in percent signs.